Wire cadge with stitched and printed figure. Explore the possibilities of making wire spoons from fabric, wire and wax with Priscilla Jones. During the workshop you will create lots of different shapes from light weight wire that can easily be manipulated with your fingers tips. You will experiment with using fabric and wax to embellish your spoons and decorate them using trimmings, haberdashery, buttons and hand-stitch. Priscilla will encourage you to explore your own ideas so please feel free to bring any of your own materials you might like to work with. This workshop is for adults, all materials are provided. There is still time to book your place on this fabulous Mixed Media Wire Sculpture Workshop at Walford Mill Crafts!!! During this workshop, Priscilla will share with you creative techniques and processes she has developed through her own experimentation. 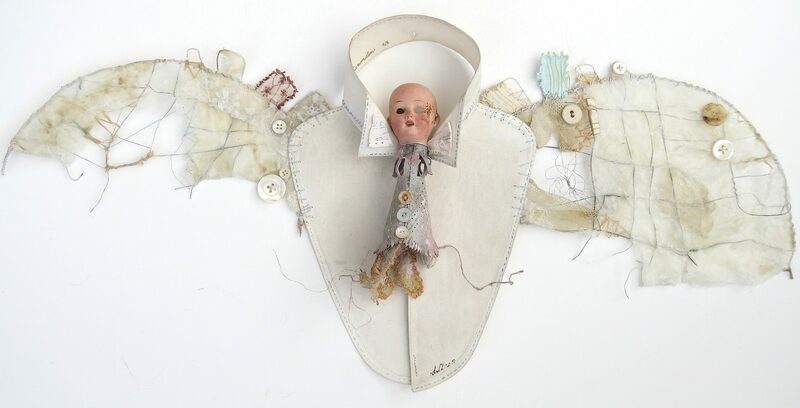 You will make your very own 3D sculpture inspired by whatever theme you wish using fabric, wire, wax and found ephemera. You will then embellish your sculpture with stitching, buttons, beads and trimmings. Materials will be provided, all you need to bring is enthusiasm and some found objects or materials from your own collecting. This is a perfect opportunity to develop ideas you may have started in previous workshops with Priscilla or you may wish to come along and learn a range of new and exciting techniques! Please bring with you: Scissors, apron and a selection of found materials and ephemera, this could be old china, broken jewellery, buttons, small tins, haberdashery or old photographs. Please note that most classes are held in the Learning Loft on the third floor accessed by three flights of stairs. Plans are in place to improve disabled access to classes however this is subject to funding. £100 per person + £6 materials payable to the tutor on the day. Explore the possibilities of making wire cutlery from fabric, wire and wax with Priscilla Jones. During the workshop you will create lots of different shapes from light weight wire that can easily be manipulated with your fingers tips. You will experiment with using fabric and wax to embellish your spoons and decorate them using trimmings, haberdashery, buttons and hand-stitch. Priscilla will be encourage you to explore your own ideas so please feel free to bring any of your own materials you might like to work with. During this workshop, Priscilla Jones will share with you the creative techniques developed through her own experimentation – so you can create your very own finished piece. Your 3D sculpture can be inspired by whatever theme you wish so do bring an idea along with you to the workshop or let Priscilla’s work inspire you to make your piece. You will learn a range of techniques and processes including how to produce a structure using light weight wire, wax, and fabric. The sculptures can be worked into with hand stitch and embellished with buttons, beads and trimmings. Even fragments of paper or small found objects can also be attached so do bring anything along you would like to work with. This is a perfect opportunity to develop ideas of your own and learn a range of new and exciting techniques!